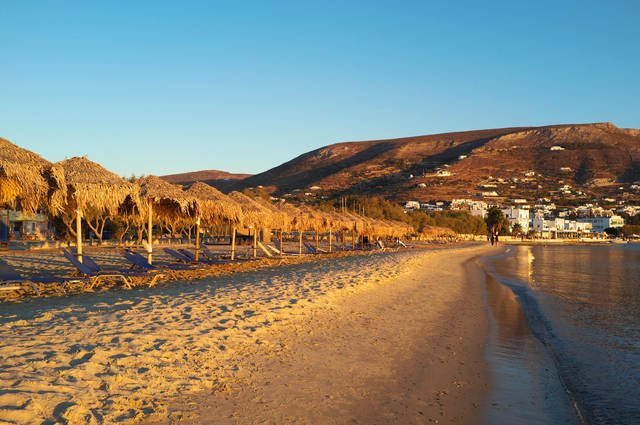 The Cyclades is made up of 220 islands, some no more than a rocky outcrop: Paros, at about 21kms from top to toe is still tiny, but it boasts some of the best beaches in Greece – and that is why we return each summer. This is a holiday for those who love sunshine and sand between their toes, lazy days and low-key nightlife. Our Houseparty is set on Chrissi Akti – Golden Beach – and provides a wonderful retreat where you can really relax. 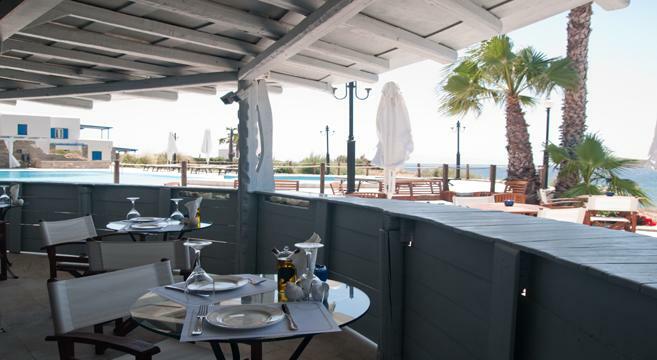 There is a handful of beach bars and tavernas nearby, and if you do feel energetic, the reliable breezes make Golden Beach popular with windsurfers. Our Host has half a dozen optional excursion suggestions, ranging from boat trips to Santorini to a night out on the town in the island’s capital Naoussa. Although Paros has its share of visitors, the island is more laid-back than our other Greek destinations, particularly during late summer. 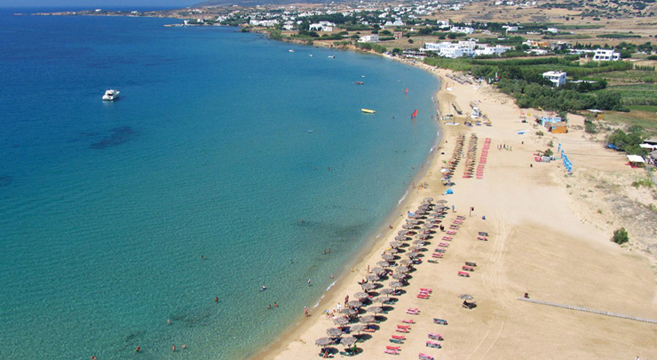 So if you want to drop out of the rat race, kick off your shoes and lie in the sun… Paros is perfect! To reach Paros, fly to Mykonos and hop on a early evening hydrofoil to our island paradise: we take care of all arrangements as part of our package, and of course a Host is on hand for all our departure dates. 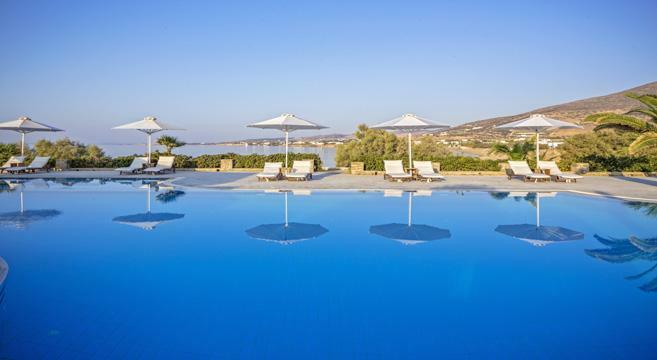 Our base is the self-contained Villa Aeolos, with its own gorgeous pool, Jacuzzi and pool bar. The amazing beach is just a few toe-tingling steps across the grass. 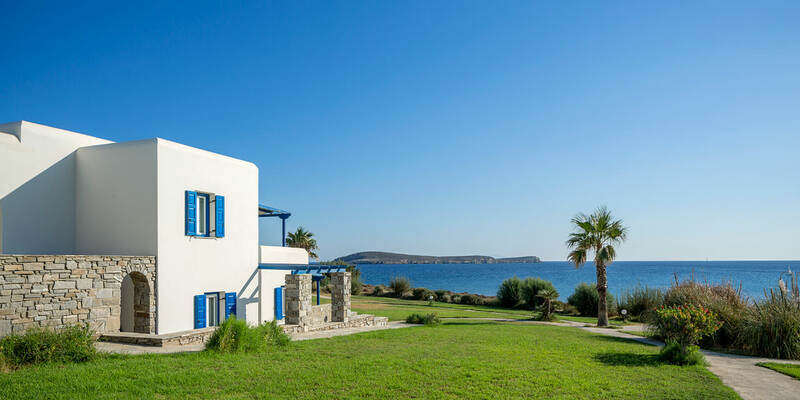 The Villa’s style is typically Cycladic, being a low-rise pastel washed building with touches of blue on the shutters and other woodwork. There are 14 rooms at the Villa, making it one of our smallest Houseparties, though if need be we can book additional rooms ‘next door’. 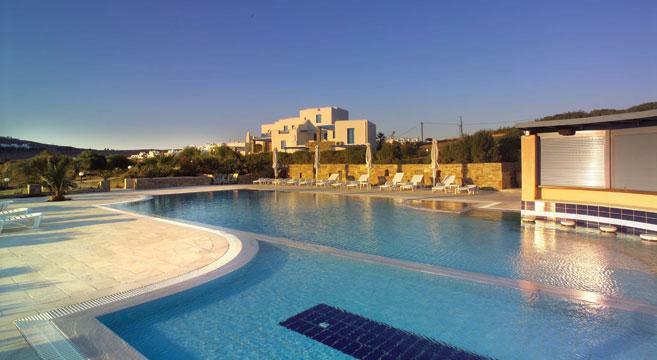 ‘Next door’ means the Poseidon Hotel which is under the same ownership as Villa Aeolos, and it is just 200 metres away. This is where we take breakfast each morning and get together for dinner on four nights in each week (with half a bottle of wine per person, and bottled water). 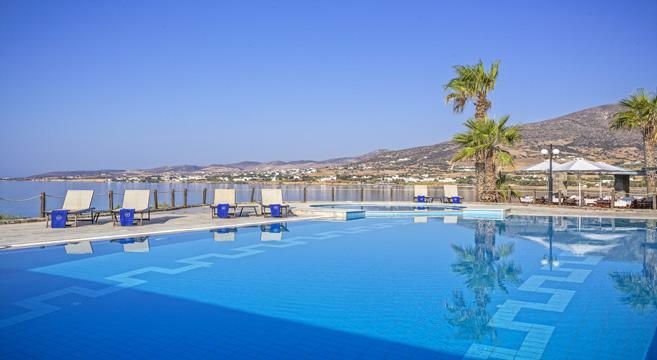 The Poseidon Hotel also has a swimming pool, plus floodlit tennis court, gym and spa, and its own bar, all of which we are welcome to use during our stay. Included dinners will either be in the hotel or at restaurants along the beach (15 minutes walk), so this holiday would not be suitable for people with walking difficulties. On nights when dinner is not included, your Host suggests local restaurants for the group to eat at own expense. There’s an Italian restaurant nearby that is a favourite, and a wider choice in Drios (a 20 minute walk), and Pisso Livadi (10 minutes by taxi). London Heathrow flights - You can now fly with BA from London. Please call for details as seats are not available to book online. Business Class seats are available. Please note, if ferry crossing times change or flights are delayed, it may be required to do an overnight in Mykonos, which would be arranged and paid for by Friendship Travel. This gorgeous Island is famous for its spectacular sunsets, with hundreds flocking to Oia just to watch the sun drop over the horizon. 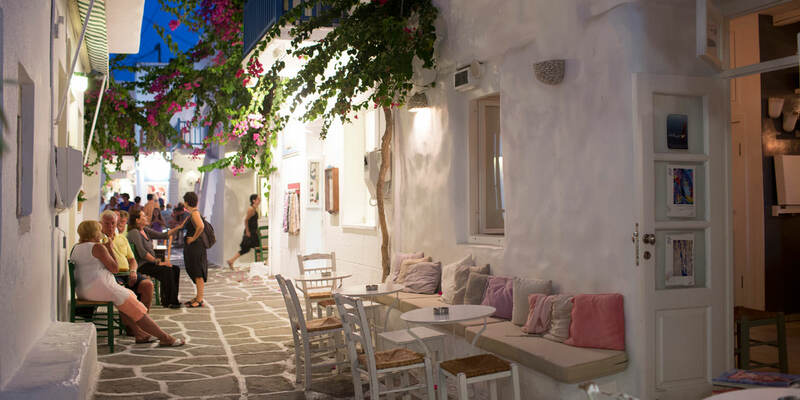 In 2016 you can add a 2 or 4 night stay in Santorini onto your 7 or 14 night package in Paros. You will fly home directly from Santorni to the UK. Friendship Travel arranges your boats from Paros to Santorini, transfers on the island, rep service and your hotel. This add-on stay is suited to independent travellers not looking for a large organised group in Santorini. Ask for full details. Our hotel in 2016 is the 4* luxury - EL GRECO RESORT – FIRA. Please be aware that from Summer 2018 the Greek Government has introduced a new tourist tax which must be paid by all visitors. The tax is to help the Greek government develop and maintain tourism products and infrastructure in Greece. If you are staying at Villa Aeolos this will cost €3 per person per night and is payable to the hotel. 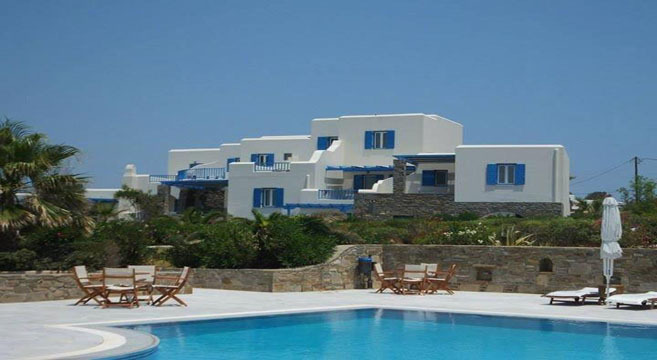 Villa Aeolos is located on Golden Beach at the south-east tip of the island, with the Poseidon Hotel next door. Our travel package includes flights to/from Mykonos, then a hydrofoil transfer to Paros: the whole process usually takes about 70 minutes. Occasionally, either flight delays or hydrofoil operation may impact on the journey to/from Paros, in which case Friendship Travel arranges accommodation on Mykonos for the first (or last) night of the holiday. While our immediate surroundings are very quiet, the island’s main town, Naoussa, is half an hour away using the island bus service. For excursions, there are several boat trips to choose from, including visits to smaller Cyclades islands, to chic Mykonos and to Santorini. It is also possible to add a short break in Santorini onto your holiday. Friendship Travel can arrange a ferry journey to Santorini at the end of your stay on Paros, for either a two or four-night break, with a direct flight from Santorini to the UK when you return home. This add-on is not Hosted by Friendship Travel, and is suited to confident travellers looking for an independent break on Santorini. This cannot be booked online: please ring the office for full details and prices. Rooms at Villa Aeolos vary in size and are traditionally furnished, but all have cool tiled floors, air-conditioning, an ensuite shower and either a terrace or balcony. Prices are based on a Standard Room with garden view: supplements apply for sea view, and for a junior suite with kitchenette. 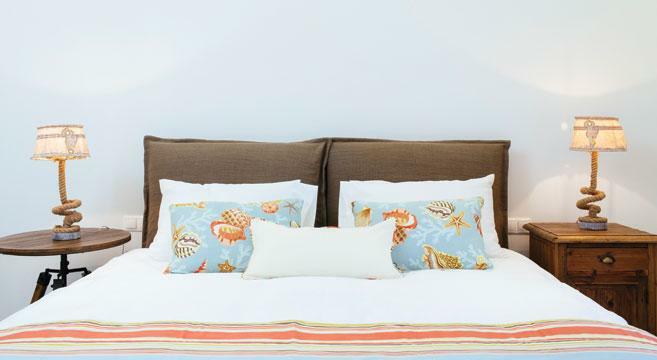 Beach towels, as well as bathroom towels are provided without any need for a deposit. Should we fill the Villa Aeolos, we may be able to book a room for you at the Poseidon Hotel next door, which offers rooms of a similar standard. Sea View Room from £20 per night; Deluxe Sea View Room from £35 per night. ATOL-bonded flights from Gatwick. Up to 4 regional airport options: supplements may apply. Scheduled flights may also be available to book by phone.